Women throughout history have used fashion as a force for good. We traded petticoats for pants in the 1800s, adorned green, white and purple to symbolize the right to vote in the 1900s, and began rocking the iconic power suit in the 1980s. Generations of women have used their clothing choices to make bold statements and influence societal change. 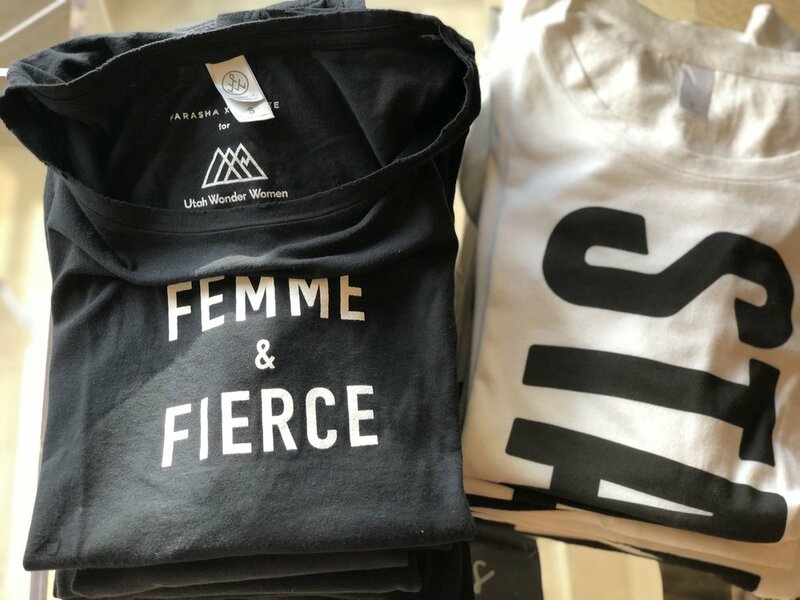 For its summer event, Utah Wonder Women came together in Park City to celebrate feminist-forward fashion and those who enrich their communities through design. Several women volunteered to showcase how they use fashion in their lives or model a statement piece from their wardrobes. Allie Zehner, a high school senior and the inaugural lead ambassador for the first SUREFIRE Utah conference last year, chose to showcase a pink, lace dress that previously belonged to her mother. As the co-valedictorian of her graduating class, she will be wearing this dress at graduation next month. Maren Mullin, owner of Gallery MAR, wore a 1980s Patrick Kelly couture velvet jacket, which previously belonged to her mother. Maren said this “power jacket” connects her to her mother as well as her occupation as a gallery owner. Chelsea Robie, a senior account executive at Method Communications, chose to showcase a thrifted sequined blazer, a gift her mother sent from home. The evening was also a celebration of the launch of the Farasha x Zenzee fashion activism apparel line. Created in partnership by fashion consulting company Farasha and designer Sharon Backurz of Zenzee, the collection features eight statement tops, perfect for the “femme and fierce.” Ten percent of all sales are donated to SUREFIRE, a non-profit event series that connects girls from different backgrounds to female leaders in their communities. We’d like to thank the Farasha team, Zenzee, Kym Wheeler of Little Brown Wren, Hilary MacMillan, Tracey Thompson and Alessandro of Mamma Mia Pizza for sharing their art and talents with us. We’d also like to thank Vanessa for allowing us to meet in her beautiful home, and the Utah Wonder Women who continue to support us, each other and local artists. Until next time!